As is often the case, the appearance of new technology requires a reassessment of the ways art and art practice are defined. For HVREdev, a Lexington-based cooperative of game designers, developers, and artists, VR hardware offers opportunities to explore the intersections of technology, video games and art. Part of the Studio 300 Digital Arts and Music Festival which showcased such projects in venues across Lexington, the Morlan Gallery at Transylvania University presented Senses of Place: VR featuring works by members of HVREdev and artists Dima Strakovsky and Richie Hoagland. These collaborative efforts attempt to push the boundaries of space, meaning, artist and audience. Attending a recent interactive performance of HVRdev’s Dreams project, one couldn’t help considering the somewhat tired question, “Are video games art?” While the ten “dreams” appear more akin to interactive art installations cross-pollinated with tech demos, they provide a means for the viewer to investigate the limits of the medium. The dreams run the gamut from enclosed rooms with collections of interactive objects such as the toy room of Dustin Peerce’s Toys, or a child’s bedroom in Zach Hunt, Shea Rembold, and Shylo Shepherd’s Shadow Play to more objective-driven experiences. Christopher Royse, Rembold, and Alexander Leverone’s Yennen’s Tale and Christona Hillard, Royse, Leverone, and Hunt’s SPAace resemble more traditional role-playing or puzzle games. Still others might be compared to rhythm or sound games, such as Rembold, Hunt, and Shepard’s bubble-popping game Bubbles or Sol Mates, a kind of life simulation and soundscape hybrid created by Royse, Hunt, Leonard Wedderburn, Vincent Mattingly, Rembold, and Leverone. 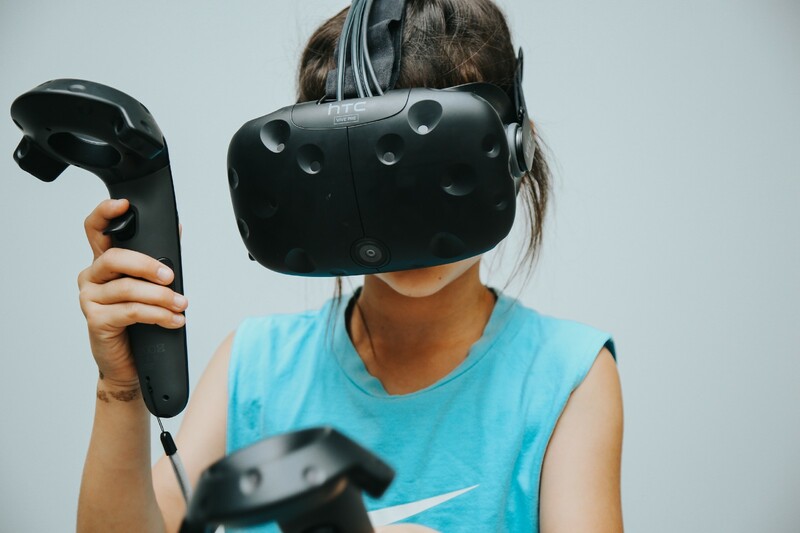 Donning an HTC Vive headset, the viewer uses a wand-like controller to explore these experiences by entering rooms, touching and moving various objects, or observing situations that play out in response to viewer’s presence in the virtual environment. One of the more fascinating aspects of this project lies in the method of its presentation. As the viewer looks around the virtual gallery space of Dreams, a sort of impossibly shaped room with ramps, high angled ceilings, columns and other features, various objects are encountered. Each dream is represented by one of these objects, metonymic models of their respective experiences. Pointing the wand at a floating series of geometric objects and pressing the wand’s trigger transports the viewer into SPAce. The viewer encounters a long hallway that opens up to room full of large objects including a candy dispenser, perfume bottles, and a crate full of jam jars. Interacting with the objects changes elements of the room, an effect the developers describe as similar to the 1990s computer point-and-click puzzle game Myst. Back in the gallery lobby, interacting with a slightly open freestanding doorway takes the viewer into Shadow Play, a bedroom where the viewer, sitting on a canopy bed, can open and close curtains and turn on and off various lights revealing comforting, strange, and even sinister objects that might inhabit a child’s dream world. While each of the games can be experienced passively, active participation produces a slew of diverse experiences, interactivity being an integral component of medium and fertile ground for investigating the ways these games bend and redefine the traditional limits of the relationship between artist, audience, and artwork. The question of the project’s artistic value, while not altogether explicit in the form or content of the individual games, is addressed through its muddling of real and virtual space. HVREdev’s ten dreams are accessed through a sort of virtual museum: each game represented by an object that, when interacted with, transports the viewer into the discrete virtual space of the individual dream. This virtual space is further nested with the space of the Morlan Gallery, which is also extended into the virtual worlds of Dreams. And beyond that, the project is available for download via Google Play, and can be experienced anywhere and anytime using an android smartphone and Google Cardboard, a stripped-down VR headset. Though this iteration of the experience limits the viewer’s ability to move within the virtual spaces of Dreams, the functionality is identical. In a sense, the presentation of both Dreams and Strakovsky and Hoagland’s Virtual Realities in the gallery helps to contextualize the medium, in the traditional sense of its being an object on display in a gallery setting. But the real space of the gallery is only a starting point for both projects to explore the possibilities of art in the virtual realm. Documentation of "Virtual Realities" performance. Richie Hoagland and Dima Strakovsky. Plus, parents and children. Of course, the debate over video games and their relation to art is not new, but the appearance of and availability VR hardware, though still somewhat price-prohibitive, is providing a means for investigating the question directly as it relates to art as an encounter with art objects in a specific space. The difference here is that artists and developers like those in HVREdev no longer require the space of the traditional gallery or museum to legitimize their own art-making practices. Instead, they explore and innovate within their own virtual spaces. The fact that Dreams is encountered both in the real space of the gallery and in its own self-contained virtual gallery lends both an urgency and opportunity to redraw the boundaries of art production to include a more a diverse host of people and practices. Even those that might not consider themselves artists in the traditional sense are using new media and technology to collaborate and produce compelling and challenging works of art. To download and experience HVREdev’s “Dreams” visit https://goo.gl/3KHRkR or search “Dreams: a Virtual Reality Art Exhibit” on the Google Play store. The project requires an Android smartphone and the Google Cardboard app and headset. Ceramics, as a process, is the transformation of dirt into something tangible through a series of construction techniques, firings, and the application of appropriate glazes. Objects that are made from the clay can be eclectic in regards to form and function: ceramists are beloved for making tableware, wall hangings, sculptures, and more. But dirt is fundamental—and so ceramists must respect the intrinsic qualities of clay and its properties if their objects are to be materially stable. As the capabilities of the ceramics becomes more inclusive, some artists working in clay find refuge in pushing the boundaries of the medium so that their final results are less likely to be material objects and are instead representations of conceptual thinking. Zoe Strecker, Forest Portal, 2016. Image courtesy of the artist and Morlan Gallery. Photograph by Katelynn Ralston. Dirt Poets, an exhibition that recently ended its run at Transylvania University’s Morlan Gallery, was an exploration into how ceramics can to tend to conceptual practices and what the products of these practices may look like, all while remaining committed to dirt as material. Lexington-based artist and Transylvania University faculty member, Zoe Strecker, curated the exhibition that ran from March 1st until March 30th. Dirt Poets was the second in a two-part series of ceramic exhibitions, following last year’s Functional Clay: Works that Contain that was curated by Strecker’s husband, Michael Frasca. Whereas Functional Clay channeled the functionality of ceramics by exhibiting an assortment of vessels made for everyday use, Dirt Poets was a presentation of non-functional ceramic objects that addressed the circumstances in which they were generated. The artworks featured in the exhibition reflected innovative or involved processes that maintain a responsibility towards clay in realizing concepts. Dirt Poets expanded the working definition of conceptual ceramics—mediums on view in the gallery included videos, hand-sculpted forms, slipcasts, and found objects. Strecker and the Morlan Gallery team built strong connections between the objects on display by creating multiple stations for each artist throughout the space that transitioned seamlessly between one another: a visitor had to journey through the entire gallery in order to understand each body of work, as well as the scope of the exhibition. For example, David Cushway’s Sublimination (2000)—a video time lapse of a bone-dry cast of the artist’s head deteriorating underwater—played on a screen on one end of the gallery while his Fragments (2012)—a slow-motion loop of a dropped teapot edited to run forwards and backwards so that the teapot would shatter and subsequently fix itself—was projected on a wall on the other. These videos acted as bookends for all other objects to rest between. Upon entering the gallery one was immediately met with Ashley Lyon’s Pillows (2011), a pair of cast bed pillows hovering a few inches off the floor on a small pedestal. Pillows, shaped with naturalistic lumps and folds, evoked the tradition of trompe l’oeil, fooling the viewer into believing they were looking down upon two frequently used headrests. Each pillow was hand glazed and painted—one donned thin, elegant stripes and the other was covered in what appeared to be brown sweat stains. The shapes and finish of Pillows made clear that these objects were about the human figure, albeit through its absence. Lyon’s sly craftsmanship was humbling—spending time with Pillows allowed for a moment of reflection on the roles we assume when away from our most intimate spaces. Lyon could have easily presented real pillows to address similar issues, but her use of the medium underscored the history of the ceramics and the idiosyncratic nature of the material. Positioned catty-cornered in the same entry space as Pillows was Strecker’s Forest Portal (2016), a kaleidoscopic video-montage of photographs the artist took while on a retreat in Pine Mountain, a ridge in the Appalachian region. Images of landscapes interchanged endlessly, appearing then vanishing within seconds and disrupting any opportunity of visual cohesion. Strecker furthered this sense of unfamiliarity by creating a flat disk of slip on the floor at the beginning of the exhibition’s run for the video to project on. While the slip was smooth and damp immediately following its transfer on to the floor, it eventually dried and began to crack, leaving a mound of fragmented clay bits by the closing of Dirt Poets. Strecker’s work emphasized the fundamental material that both the slip and the landscapes are made of—dirt. Forest Portal was a manifestation of Strecker’s interest in sustainable practices that addressed concepts like ephemerality and cyclicality. Sharan Elran, Rough Vase series, 2011. Image courtesy of the artist and the Morlan Gallery. Photograph by Hunter Kissel. Standing next to Forest Portal was Sharan Elran’s Rough Vase (2014-15) series. Elran subverted the notion of quintessential vessel design by using molds made from 3-D printers. Each mold was a puzzle of randomized parts: Elran divided a digital model of a vase into vertical and horizontal quadrants and then allowed a computer to randomize the arrangement of the separate pieces. The objects made from these molds were on display in the Morlan Gallery, each standing atop a thin pedestal. Whereas the impurities from the casting process would traditionally be scraped off to achieve a cleaner shape, Elran left them intact on his vases—he even exaggerated them by allowing the mold itself to retain spaces in which the liquefied slip could spread itself to dry. The artist was deliberate in allowing his craftsmanship to show in the Rough Vase series, and in doing so he exposed normal ruptures in a specific process that are typically unknown to the viewer. By stopping short of a more refined object, Elran posits the artist’s creative thinking as the subject of each object, rather than the functionality of vases themselves. Dirt Poets advanced the understanding of how clay can be employed by presenting conceptual ceramic works that communicated intimately. Moreover, the exhibition managed to challenge traditional conventions of how clay can be utilized under the guise of fine art. Here, medium seemed like a beginning rather than an end—it assisted in articulating an idea instead of standing as the product of one. Strecker’s curatorial intuition carefully considered how this conceit could be realized. Indeed, the primary subject of each work was the method in which it took to generate it as well as each artist’s commitment to process. If this were an exhibit of canonized conceptual art practices, one may have had expected to see language used as the primary medium. Dirt Poets, however, was a presentation of conceptual ceramics—one that placed emphasis on how a commitment to materiality can take many shapes, forms, or ideas. Dirt Poets ran from March 1st to March 20th, 2016 at the Morlan Gallery at Transylvania University in Lexington, KY.